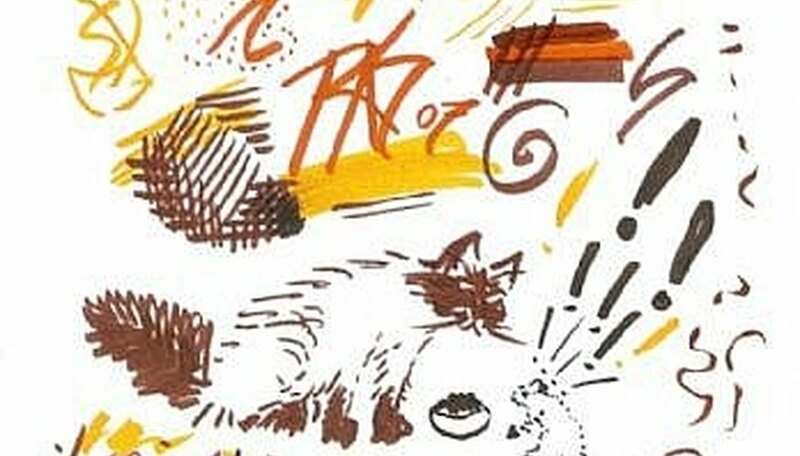 Brush pens are a little like ink painting, a little like pen and ink drawing, and a quick and easy way to write in Japanese or Chinese if you know how. Sold first as Japanese writing pens, they are a great convenience for cartoonists, comic book artists and fine artists -- best of all, they're easier to use than most of the mediums they function like! First, test your brush pens and just make marks with them. Curving marks, straight lines, narrow lines, wide lines, dots. Try to see how many kinds of marks you can make. If you only have one brush pen in black, that's fine too. If you bought a set of colored brush pens, test each of the colors and draw strokes over other colors to see how they mix. Do a group of marks to show all the colors in your set. If some of the marks start to look like something specific, don't be afraid to doodle it -- or worry if it's not perfect. This test page should be labeled and set aside for reference, because it'll become your guide to what each of the colors does in combination with the others, what marks you can make with them, and whether each pen performs exactly the same. Try varying pressure, drawing fast or slow, lifting the pen at the end of strokes, dotting lines, stippling, crosshatching. Any marks you can make with these pens, you'll need to know how it feels and how it looks on the page. I'll use a six color Pitt Artist Pen Terra Set for the demonstrations, but if you have more colors, use them all. Some brush pens are transparent. Others are opaque. Some have watercolor ink, and water will dissolve, lift and blur the marks. Your brand may be available in 96 colors or more like some water soluble artist brands, or only come in black and brown like some Japanese writing pens with replaceable cartridges that have replaceable points that come with the cartridge. Label your test page in one of the darkest colors, and try your signature or monogram on it. Brush pens are expressive, and you may have to practice your signature for a while to make it legible if you're used to pressing hard with pens. 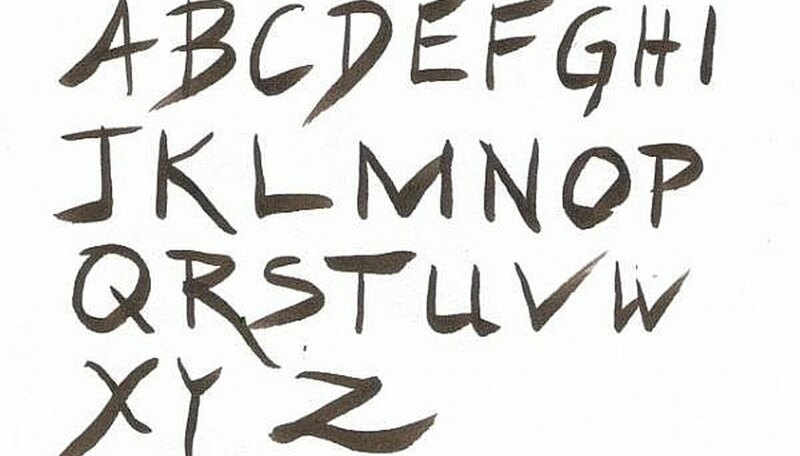 Try writing out the alphabet in capital letters, varying the lines for your strokes and using flicking strokes. This can create a style of beautiful brush lettering, calligraphy that's almost Asian in flavor. It's a good exercise because not only will you learn thick and thin strokes, flicking and pressing lightly for straight thin lines, but you'll also gain control of your lettering and be able to do jazzy fancy lettering whenever you like. Try other styles of lettering that you're familiar with. If you do write in Japanese or Chinese, try writing out some letters and sentences in your chosen language. Brush pens make learning these languages much easier. If you don't have a book on Japanese lettering, try copying some text in a Japanese language manga comic as carefully as you can. Practice the symbols until they become familiar if you're interested in this for language study. Write out a short poem you like or a favorite saying in brush calligraphy, alphabet of your choice. Drawing letters is important practice for drawing in general, because getting them legible helps establish control of the brush pen. Adults often forget that writing begins with drawing letters -- and that is still drawing. Get a book on Japanese ink painting, sumi-e, purchase one or borrow it from the library. Look up "The Four Gentlemen," which are the four classical teaching subjects of Japanese ink painting. They are beautiful and useful in many kinds of brush drawing and painting, so try them with your brush pens. 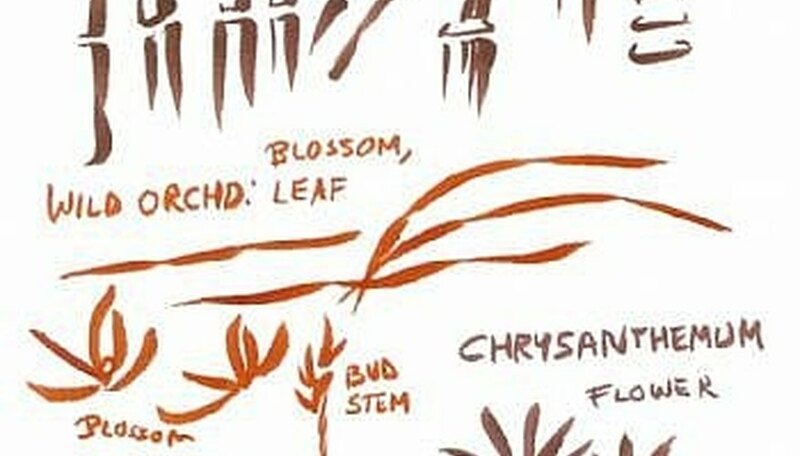 Make examples of each of the four classical plants and their strokes, and label them, so that when you return the library book you can continue to practice these simple strokes and combine them to create beautiful artwork. While brush pens won't give the shaded dark-to-light effects of sumi-e ink painting, which are achieved by how much water is in the ink and putting color just at the tip of a wet brush, they are excellent for practicing the motions of the strokes. Once learned, you can try these strokes again with watercolor or sumi-e ink and see your results come closer to the book. For now just do them the way they come out in brush pen. Light to medium transparent colors may work well for these in some ways, but dark colors are easy to see. These four things to paint are Bamboo, Wild Orchid, Chrysanthemum, and Plum Branch. Don't try to get them perfect, get them recognizable so that you can remember the strokes and practice them until you like the results. People spend a lifetime mastering these painting techniques, but with brush pens, beginners get an easy start and can get nice looking results. Try to work quickly and repeat what you did if you didn't quite get it right. Save mistakes as they are also experiments that may give you new strokes you just invented! The object of this step is not to learn how to do Asian art in a day or two. It's to get used to getting different effects by light pressure, lifting strokes while moving, curving strokes, and imitating one-stroke masterpieces by Asian style painters with several opaque strokes to get something that looks something like their work. You will gain more control of the brush pen with each exercise, and learn strokes that can help you draw anything you like. It will free up your strokes to become more expressive than pencil strokes or regular pens. Your mind may know that brush pens can do thick and thin strokes and many expressive marks that can't be done with other kinds of markers and pens. But your hand will learn how to do them with precision by copying Japanese painting techniques, and your calligraphy will get easier from drawing these traditional subjects in brush pen. After three steps of nothing but tests and exercises, let's draw something real with brush pens. It'd be nice to have something that would make it to the fridge. Start with a pencil sketch of something you find easy to draw, or copy my drawing -- a goldfish in a fish tank with some weeds. The sketch lines are deliberately left in to demonstrate that you don't need to follow your sketch precisely. Work fast and dramatic. If you make a mistake, keep it and keep going. Maybe your fish is tricolor because you covered up a blotchy part with a deliberate patch of dark brushwork, or you decided to leave part of the fish white. Maybe your fish is a red and blue betta instead of a goldfish because those are the colors you have, or your weeds overlap each other. 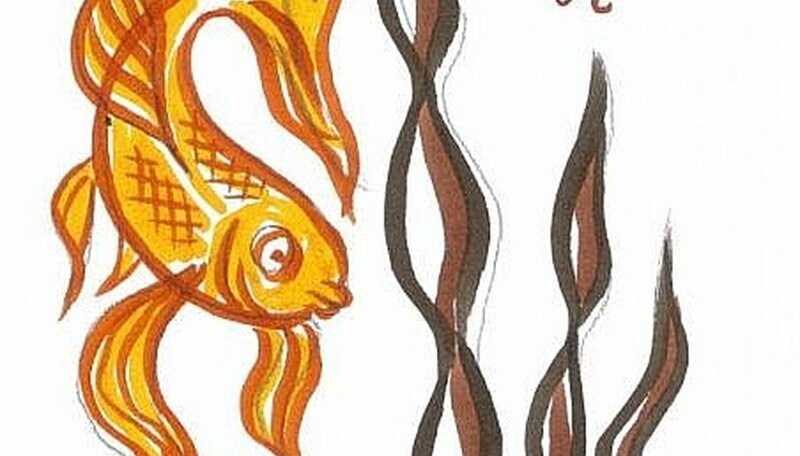 Do what you like with the fish sketch, or anything else you draw. The more often you sketch with brush pens, the more proficient you'll become in controlling thick and thin lines, quick expressive marks, shading and detailing. They're great for gesture drawing because you can't go back and change any line you got down. You can do curved, thick and thin, light, heavy or fluid marks, but you have to keep going so there's no reason not to just do it fast and do another sketch. Brush pens are also great for coloring because they'll go into small tight details but quickly fill in large areas smoothly. Test yours to see if overlapping light colors darken, and whether you like that effect. If you don't, work back and forth rapidly with heavy strokes to fill an area and then go around the edges after you do the middle, since shading usually goes to the edges anyway. Brush pens are an inexpensive, fun way to improve your brush strokes -- and that will lead in time to masterful painting and Asian calligraphy as well as quick cartoon drawing! Don't be embarrassed if your drawings and lettering come out loose, sloppy and careless looking. Brush pens are a spontaneous medium, encouraging artists to loosen up and work more intuitively. Accept accidental results and do something fun with them to turn them into serendipity. You don't have to fill in lines exactly. Fill in loosely and leave some white showing. Use wild strokes and textural marks with brush pens. Working fast and loose is often better than slow and careful with this medium. You'll get beautiful thick and thin marks flicking fast and get used to sending them where you want them to go. Keep brush pens and all pens tightly capped when not in use. They dry out as quickly as other felt tip pens. Organize your brush pens to suit yourself, but keeping them in the same order all the time helps you find the colors you need fast. It may not matter for a small set, but with large sets this is very useful.